Tumor cells are unable to synthesize asparagine, and therefore must utilize what is available in the extracellular environment. The agent acts by hydrolyzing extracellular asparagine to aspartate and ammonia. The tumor cells are then deprived of a necessary nutrient, and protein synthesis is inhibited leading to cell death. The agent is specific for the G1 phase of the cell cycle. Resistance occurs because of the development of the tumor cells ability to produce asparagine synthetase that allows them to synthesize the required amino acid. Antibody production directed at asparaginase may be stimulated by the agent as well. The agent remains in the extracellular space after parental administration and is 30% protein bound. The metabolism of the agent has not been well characterized and the plasma half-life depends on the formulation of the drug. The E. coli-derived agent has a plasma half-life of 40 to 50 hours, whereas polyethylene glycol-asparaginase's half-life is 3 to 5 days. Adverse effects include hypersensitivity reactions, fever, chills, nausea, lethargy, confusion, hallucinations, and possibly coma. Myelosuppression is not generally seen. An increased risk of bleeding and clotting is seen in half of the patients taking the agent. Estramustine as the phosphate is available in 140-mg capsules for the treatment of prostate cancer. Although originally designed as an alkylating agent, it has been shown to be devoid of alkylating activity and functions as an inhibitor of microtubule function by binding to microtubule associate proteins (MAPs) and also binds to tubulin at a site that is distinct from that of the vinca alkaloids but thought to partially overlap with that of pacilataxel.171 The major mechanism by which cells become resistant to the agent involves increased efflux, although this is not mediated by Pgp as is the case with other microtubule inhibitors such as the tax-anes and vinca alkaloids. Therefore, the agent does not show cross-resistance with these agents. As an inhibitor of micro-tubules, it is cell cycle specific acting in the M phase. The agent is well absorbed upon oral administration with hydrolysis of the water solubilizing phosphate beginning to occur in the GI tract. Metabolism involves the formation of the active estromustine, which arises from oxidation of the C17 alcohol to give the ketone. Additional inactive metabolites result from carbamate hydrolysis to give estradiol and estrone. The parent and metabolites are primarily eliminated in the feces with a terminal elimination half-life of 20 hours. The adverse effects of the agent are nausea and vomiting, which is generally mild but the severity may increase upon prolonged administration. Gynecomastia also commonly occurs, and diarrhea may also be seen. Less commonly seen effects include myelosuppression, skin rash, and cardiovascular abnormalities including CHF. There are several agents that manipulate the endocrine system to inhibit cell growth that are used in treating cancers that are endocrine dependent. Additionally, there are also several monoclonal antibodies that have been developed and are currently used in treating cancer. Both of these groups of agents are discussed elsewhere in this text. 1. The agent shown is most likely to result from which of these agents? 2. The following agent is capable of chelating iron and generating ROS. It has been associated with pulmonary tox-icity, which is related to reduced levels of an enzyme in lung tissue that normally inactivates the compound. 3. The following agent is an inhibitor of a topoisomerase enzyme and binds to both DNA and the enzyme itself. It has been associated with the production of cardiotoxicity that may progress to CHF related to the production of ROS. 4. 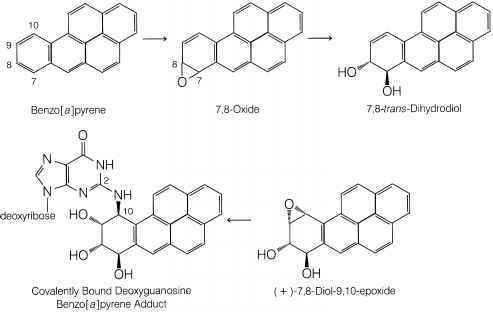 For the agent shown below, what would be the effect of coadministration of a CYP inducer and an inhibitor of alcohol dehydrogenase?